Abortion as a “core value” of Americans. The repeal of the Hyde and Helms amendments prohibiting the use of taxpayer funds for abortions. The repeal of reasonable safety regulations for the abortion industry. Thus, the party has moved from a position of “safe, legal, and rare” to “unlimited and state-supported." Unless you speak out, the media will not take notice! So send out your personal message on Twitter, Facebook, or elsewhere: "Have you seen the Democratic Platform on abortion? Radically out of the mainstream! Are they crazy? Are they trying to run off voters?" Use the hashtags #thatscrazy #openthebigtent. Ask all the other pro-life friends you know to join the clamor in social media, spreading the word as far as we can about this affront to American values that is destroying the Democratic Party. These facts should be causing the Democratic leadership to scramble for a way to turn around election results. Yet, as Matt Iglesias wrote for Vox.com: “[T]he truly striking thing is how close to bottom the party is already and how blind it seems to be to that fact.” Many other political columnists have pointed out the demise of the party, its insane rigidity on abortion support, and its sell-out to the abortion lobby. Nothing could help Donald Trump more than this extreme Democratic abortion stance! We will make our case in Philadelphia at the Democratic National Convention, so join us if you can.. After you post on social media, send us your ideas and participate! One-third of the party membership is pro-life—a number too large to disregard. Our party, which champions social justice and the vulnerable in so many other areas, should care about the weakest and most defenseless humans—those in the womb who have no voice. For many Democrats, and taxpayers, opposition to abortion is a matter of deep personal conscience, which should be protected under our party's commitment to no discrimination against any creed. 56% of Americans oppose taxpayer funding of abortion, and only 39% favor it (CNN Poll 2014), while a 2016 Marist Poll shows 68% opposition. The statistics are sobering. Since 2008, the Democratic Party has lost more than 1,000 state and national races — including 11 governorships, 13 U.S. Senate seats, 69 U.S. House seats, and 913 state legislative seats (adding up to 30 state legislative chambers) — as it has increasingly alienated Democratic pro-life voters. Day explained how pro-life voters can win elections for Democrats. The national party’s overwhelming support for NARAL (National Abortion Rights Action League) and Planned Parenthood causes serious conflicts for one-third of all Democratic voters, who feel increasingly uncomfortable with the focus on abortion rather than support for pregnant women. This is a crucial election year in which the party has a choice to make. It either allows the abortion industry to control the party, or it can “OPEN THE BIG TENT” and welcome back the pro-life voters — millions who are critical to the agenda. “This is how we can win,” Day said. In addition to the billboard, Democrats For Life will release a report at the convention on how the Democrats lost Middle America and how to rebuild the party. It will also honor Governor John Bel Edwards with an award for his whole life principles. Washington, DC: The United States Supreme Court’s ruling in the Whole Women’s Health case means that the health of women will be less important than the profits of abortion facilities. “This ruling does not protect women; instead it makes it more likely that we will have more Kermit Gosnells,” said Kristen Day, Executive Director of the Democrats For Life of America. Whole Women’s Health sued Texas officials after the state passed a law that sets minimum safety requirements for abortion facilities. The law ensured that women would see doctors with hospital admitting privileges, in case of an emergency, and that abortion facilities would have the same standards as any other surgical centers. Rather than comply with these health-related provisions, Texas abortion providers filed suit. The DFLA filed an amicus brief taking the side of women. Had standards like those in Texas been in effect in Philadelphia, they would have made it much harder for Kermit Gosnell to run his horrific abortion mill that took the lives of women and born babies. Gosnell, whose case was the inspiration for the Texas law that sought to protect women, was convicted in 2013, on three counts of first-degree murder for killing babies born alive during abortion procedure, and on one count of involuntary manslaughter for the death of Karnamaya Monga. Monga was reportedly given a lethal dose of anesthesia by Gosnell’s staff. The Whole Women’s Health argument claimed that Texas was harming women by setting safety standards and requiring the doctors who perform abortions have admitting privileges at the nearest hospital. “How can such standards be considered an ‘undue burden’ to abortion when even the National Abortion Federation recommends that women choose a doctor who can admit them to a nearby hospital?” Day said. “Five unelected judges have now blocked these particular safety measures, but there are different laws on the books in many states that have been upheld by the Courts. State regulators must vigorously enforce those protections for women,” Day added. DFLA has been at the forefront of really helping women by advocating measures that protect life, and that support women and children's health. DFLA was able to help add the Pregnancy Assistance Fund to the Affordable Care Act, making sure that expectant and parenting mothers have a network of support to gain access to health care, child care, family housing, and other critical services. Want to join or renew your DFLA membership? Louisiana’s John Bel Edwards is showing the nation what a Whole Life Democrat looks like, signing laws to extend Medicaid and to protect the health of women. Bel Edwards made being a Pro-Life (Whole Life) Democrat part of his campaign for governor, and he followed through on his promises once he took office in January. The day after being sworn in, Bel Edwards signed an executive order expanding Medicaid to cover an additional 300,000 Louisiana residents. On May 19th, he signed into law two new protections for women. The first requires that all doctors who perform abortions be board-certified either in obstetrics and gynecology or in family medicine, or that the doctors be certifiable in these fields. 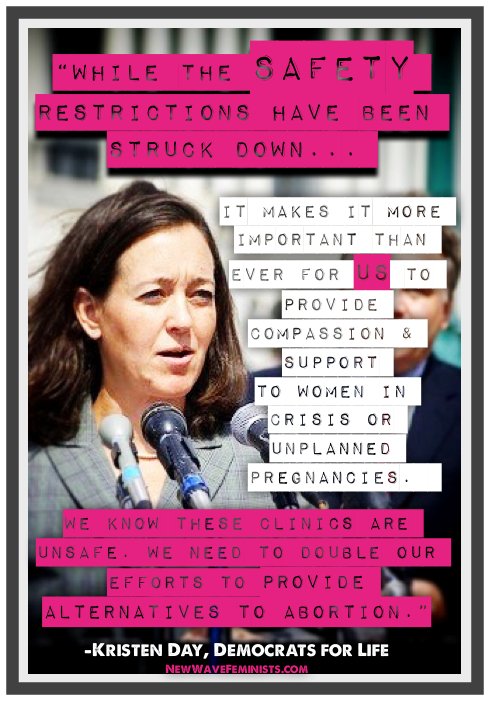 The law is intended to protect women from dangerous abortion mills run by unqualified staff. The other protection extends the waiting period for women seeking abortions from 24 hours to 72 hours. This additional time affords women the opportunity to reflect and make a real choice, without being pressured into an abortion. By protecting the poor and the vulnerable, Bel Edwards shows what a Whole Life Democrat administration can do, and why this type of leadership is so needed in the Democratic Party right now. “Americans are tired of having two parties that don’t represent their beliefs. There are more than 20 million Pro-Life (Whole Life) Democrats ready to fight for a candidate who shares their commitment to freedom and justice, security and prosperity, equality and community, and hope and progress,” said. Day. During another incoherent media appearance – incoherent and contradictory media appearances seem to be hallmarks of Donald Trump’s presidential campaign – the former reality TV star and leading contender for the GOP nomination said that women who get abortions should be punished. “There has to be some form of punishment,” Trump told Chris Matthews during the taping of an MSNBC town hall event. It’s well established that Trump is a misogynist, and his clueless comments about abortion show that he is not really pro-life. Only a fraud pretending to be pro-life would say something like this comment because he thinks that’s what his followers want to hear. Sadly, his comments reflect his empty posturing on abortion. The GOP for decades has been the party that opposes abortion, while at the same time ignoring or opposing policy changes to support pregnant women that would ultimately reduce the number of abortions. Women don’t need to be punished. They need jobs. Their families need jobs paying family living wages. They need greater access to affordable healthcare. They need paid family leave. They need affordable childcare. A woman needs to know that she doesn’t have to choose between her baby and her education or career. Trump’s ugly statement calling simply for punishment, while never mentioning support for women and children, is a more extreme version of the GOP’s position that wants to end abortion without providing a social safety net. The mainstream Democratic Party needs to pay attention. Pro-lifers are waking up to the fact that they no longer have a home in the GOP. Democrats need to embrace the Whole Life philosophy that provides protection from conception to natural death, which would give millions of voters a voice – and a real choice.